By Keith Cowing on February 28, 2011 1:55 PM. 2011's Next-Generation Suborbital Researchers Conference (NSRC-2011), will be held in Orlando, Florida 28 February through 2 March. "The meeting will also include invited talks by experts in diverse fields that include microgravity sciences, atmospheric science, space life sciences, planetary science, education, and crew training. 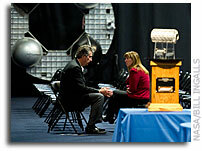 NSRC-2011 is the place to be to learn how to marry your research, education, or business interests to next-generation suborbital spaceflight. For more information go to http://nsrc.swri.org/"
"Reflecting the interest in the science community, more than 300 people are registered to attend a conference this week at the University of Central Florida in Orlando, organized by Dr. Stern, to discuss suborbital research. Researchers, Dr. Stern said, "vote with their feet. They go to these meetings." By Keith Cowing on February 28, 2011 11:54 AM. "Three scientists, including a former NASA executive, will become some of the first scientists to fly on a commercial spacecraft -- and they will fly multiple times -- under the terms of two funded agreements announced between the nonprofit Southwest Research Institute and two commercial spacecraft providers, Virgin Galactic and XCOR Aerospace." Keith's note: Something interesting is happening: XCOR and Virgin Galactic, two different companies with two different approaches to providing crew and cargo access to space on suborbital vehicles are both announcing commercial contracts to fly payloads and private payload specialists. The funding force behind this ground breaking dual lauch provider effort is the Southwest Research Institute (SwRI). Contrary to the dismissive view many have taken with this emerging sector i.e. that it is only suited for well-heeled tourists, these announcements show that there is viable commercial and scientific work to be done on these vehicles as well - work not dependent on government contracts. Moreover, this commitment by SwRI shows that this activity can be conducted wholly within the private sector between research organizations and commercial providers. In addition, these announcements underscore the growing understanding that there is value to using regimes other than orbital flight, and that other portions of near-Earth space, the so called "Ignoreosphere", have value both as locations to conduct scientific research and education as well as being regions of intrinsic value themselves worthy of future investigation. By Keith Cowing on February 28, 2011 11:40 AM. "Southwest Research Institute (SwRI) announced pioneering agreements today to send three scientists as payload specialists aboard eight suborbital flights -- some to altitudes greater than 350,000 feet, above the internationally recognized boundary of space. No other organization has yet concluded contracts to fly its researchers in space aboard next-generation suborbital spacecraft. Also unique is the number of payload specialist researcher seats involved -- eight at a minimum, with options up to 17 high altitude or space flights." By Keith Cowing on February 28, 2011 10:10 AM. "Sir Richard Branson's Virgin Galactic, LLC, the world's first commercial spaceline, announced today the first ever commercial contracts to fly scientists into space for the purpose of conducting research experiments. Virgin Galactic's signed contract with the Southwest Research Institute is the first such agreement to fly scientists into space (over 100 kilometers or 328,000 feet above the Earth), enabling valuable microgravity, biology, climate and astronomy research." Keith's note: Ah, Virgin Galactic is playing up the Von Karman line as the definition of "space" so as to be able to say "first ever commercial contracts to fly scientists into space" in a press release. Oh well, XCOR announced their contract for similar services last week. Then again the NASA uses a lower altitude. Which definition of "space" is "official"?
" ... NASA pilot Bill Dana, and family members representing deceased pilots John B. McKay and Joseph A. Walker, received civilian astronaut wings acknowledging their flights above 50 miles [62 km] high." By Keith Cowing on February 28, 2011 7:09 AM. "We stand at the forefront of what may be a renaissance in suborbital spaceflight. As such, it is paramount that we ask ourselves the most basic and fundamental inquiry regarding this development. Why does it matter, especially when compared to other developments made with space technology? Because the fact remains that even after nearly sixty years, human spaceflight remains an extremely expensive, hazardous, and dangerous undertaking. Only Russia, the United States, and China have been successful in developing and launching their own manned spacecraft. To date, only slightly more than five hundred people have flown in space." By Keith Cowing on February 28, 2011 6:52 AM. "At the commencement of the 2011 Next-Generation Suborbital Researchers Conference (NSRC) being held in Orlando, Florida, XCOR Aerospace announced its initial team of suborbital payload integration specialists who will begin taking orders and facilitating experiment development and integration for commercial, educational and government suborbital research missions aboard XCOR's Lynx reusable suborbital launch vehicle. Capable of up to four flights per day, the Lynx is expected to provide three to four minutes of micro-gravity and/or exposure to the harsh environment of space and the opportunity to investigate largely unknown regions of our upper atmosphere critical to environmental studies." By Keith Cowing on February 25, 2011 9:00 AM. 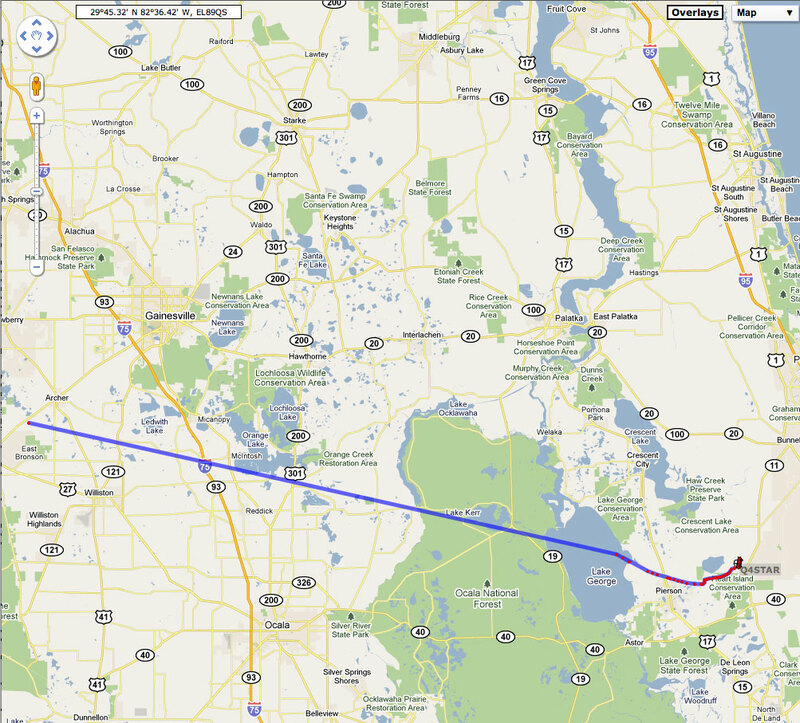 Keith's update: The recovery team found the balloon and payload exactly where they expected it to be (recovery photo). They are heading back to the hotel to start seeing what the cameras and computers captured. We're optimistic that the payload was where we wanted it to be during Discovery's launch. By Keith Cowing on February 24, 2011 8:11 AM. "In a first for the reusable suborbital launch vehicle industry, XCOR Aerospace announced today that the Southwest Research Institute (SwRI), a commercial entity, has purchased six suborbital flights to carry SwRI experiments as pathfinder missions for other SwRI suborbital clients. This is the first such contract SwRI has issued, and XCOR is proud to be chosen for this opportunity." By Keith Cowing on February 22, 2011 8:12 PM. "As it awaits congressional action on its 2011 budget, NASA is proceeding with plans to award roughly $200 million to companies developing technologies in support of the agency's commercial space transportation goals. NASA contacted at least seven companies in February, inviting Alliant Techsystems (ATK), Blue Origin, Boeing, Orbital Sciences Corp., Sierra Nevada Corp., Space Exploration Technologies (SpaceX) and United Launch Alliance (ULA) to Johnson Space Center in Houston to discuss their proposals for a second round of awards under the agency's Commercial Crew Development (CCDev) program, according to industry sources. NASA hopes to make the awards in March." By Keith Cowing on February 22, 2011 10:03 AM. "This notice is issued in accordance with 35 U.S.C. 209(c)(1) and 37 CFR 404.7(a)(1)(i). NASA hereby gives notice of its intent to grant a partially exclusive license in the United States to practice the invention described and claimed in United States Patent 7,509,774 (issued March 31, 2009) and NASA Case No. MSC 24201-1, entitled ``Apparatus For Integrating A Rigid Structure Into A Flexible Wall Of An Inflatable Structure'' to Bigelow Aerospace, having its principal place of business in North Las Vegas, Nevada. The fields of use may be limited to expandable spacecraft, vehicles, modules, and the like for operation in exoatmospheric space, including applications, sales, lease, and other commercial uses or applications thereof for research and development, space tourism, and other commercial endeavors. The patent rights in this invention have been assigned to the United States of America as represented by the Administrator of the National Aeronautics and Space Administration." By Keith Cowing on February 19, 2011 8:10 PM. "..identifies the activities associated with Payload Mission Integration Team (PMIT) in managing and integrating International Space Station (ISS) payload flight, stage, and increment activities. The contents of this document are consistent with the tasks and products as defined in SSP 50200-01, Station Program Implementation Plan, Volume 1: Station Program Management Plan. 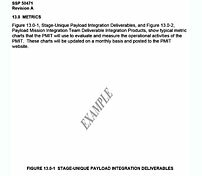 This document is under the control of the Payloads Control Board (PCB)." 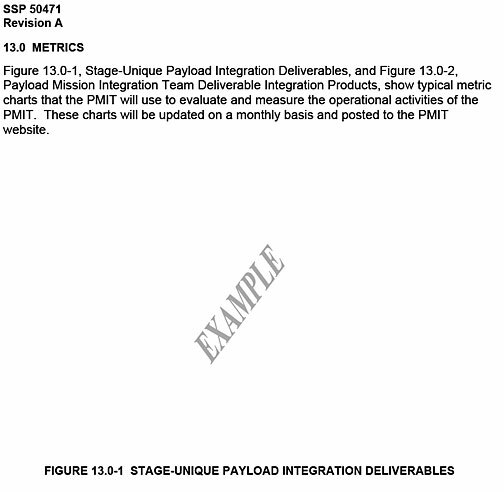 "13.0 METRICS Figure 13.0-1, Stage-Unique Payload Integration Deliverables, and Figure 13.0-2, Payload Mission Integration Team Deliverable Integration Products, show typical metric charts that the PMIT will use to evaluate and measure the operational activities of the PMIT. These charts will be updated on a monthly basis and posted to the PMIT website." Keith's 16 Feb update: A reader notes: "I'm an engineer @ JSC and I checked the official document electronic depository and, lo and behold, the document is correct - graphic and all. This may be another one of those moments that can truly be blamed on a difference in versions of Adobe, or someone otherwise messed up the document somehow when it was posted." I guess my question is whether anyone at NASA reads these documents and conducts a sanity check before saying that they are fit for public release and formal use in the procurement process. It would seem that they do not. Will they add this complete version that this reader refers to - and inform everyone that the earlier document was incomplete? In the coming days I'll discuss this data dump habit NASA has - one wherein documents that are often out of date, incomplete, and/or and hard to understand are simply thrown out at prospective bidders - with no context or explanation whatsoever. Take this stand alone chart by Mark Uhran "Queuing Model: Payloads" as an example. It is simply posted with no associated text explaining what it is, or how bidders need to follow or incorporate it. Keith's 17 Feb note: The ISS National Lab CAN team seems to not care that a more accurate (complete) version of this document is available in NASA's document library - - the old version with blank figures is still being provided to prospective bidders on the CAN web page. By Keith Cowing on February 18, 2011 4:56 PM. "We found that NASA's LSP acquired ELVs from 2008 through 2009 that were within costs and timeframes established by the NLS contracts. However, we also found that NASA's published strategy for acquiring medium-class launch vehicles after 2010 may not be the most cost-effective or advantageous to the Government because it did not include as a possible option use of Minotaur, a launch vehicle that uses a U.S. Government-furnished rocket motor from decommissioned intercontinental ballistic missiles." By Keith Cowing on February 18, 2011 8:35 AM. "[Bolden] said he planned to formally announce "within the next few weeks, if not days" that KSC will be the home of the NASA office that oversees the development and operation of commercial space taxis. NASA's primary launch operations site never has hosted a human spaceflight project office. That work historically has been done at Johnson Space Center in Houston or NASA headquarters in Washington, D.C., and during Project Mercury, at Langley Research Center in Hampton, Va."
Is Robonaut Going to Get a Japanese Tweetbot Girlfriend In Space? By Keith Cowing on February 17, 2011 3:47 PM. "Japan's space agency JAXA announced this week that it is looking at a plan to send a humanoid robot to the space station in 2013 that could communicate with the ground through Twitter -- primarily feeding photos, rather than original ideas -- and provide astronauts with "comfort and companionship." Following up on NASA's "Robonaut" R-2 program, which is set for launch on the Discovery shuttle next week, the Japanese android would be part of a larger effort to create and refine robots that can be used by the elderly, JAXA said in a statement." By Marc Boucher on February 17, 2011 6:02 AM. "Today, the X PRIZE Foundation announced the official roster of 29 registered teams competing for the $30 million Google Lunar X PRIZE, an unprecedented competition to send a robot to the Moon that travels at least 500 meters and transmit video, images, and data back to the Earth. This group of teams signifies this new era of exploration's diverse and participatory nature as it includes a huge variety of groups ranging from non-profits to university consortia to billion dollar businesses representing 17 nations on four continents. The global competition, the largest in history, was announced in September 2007, with a winner projected by 2015." By Keith Cowing on February 16, 2011 1:18 PM. "In the summer and fall of 2010, the world followed the story of thirty-three Chilean miners trapped nearly half a mile underground and celebrated their successful rescue in October. A team from NASA that included physicians, a psychologist, and engineers contributed to that success, providing knowledge gained from spaceflight programs to the government and experts dealing with this down-to-earth emergency. Traveling to the mine site in Copiapo, Chile, they developed a cooperative relationship with Chilean officials and specialists that made it possible to share their knowledge effectively." By Keith Cowing on February 15, 2011 12:38 PM. Keith's 14 Feb note: At the ISS National Laboratory Cooperative Agreement Notice (CAN) Public Day on 10 December 2010, Mark Uhran said that the CAN would be released on 14 January 2011. According to Uhran letters of intent would be due on 14 February 2011, proposals due 4 March 2011, with an award in May 2011. The CAN was released on Monday, 14 Feb - one month late. The release date slipped one month but the award date has slipped 2 months. No email notice has been sent out nor notice made on the ISS National Lab website. Notices of Intent are due on 4 March, proposals are due on 1 April, the anticipated selection announcement is 31 May, and the anticipated award date is 1 July. You can find the CAN and associated files here. In his remarks at the ISS National Laboratory Cooperative Agreement Notice (CAN) Public Day, Mark Uhran said that NASA had roped off some of the most interesting stuff (human space physiology and spacecraft testing and engineering) as being off limits to proposers. Anyone proposing to do this will be considered "non-responsive" (his words). Oddly, these are two of the most promising uses of the ISS - the sorts of things that a lot of people would like to use the ISS for. No mention is made in this CAN as to whether Uhran's statement is indeed true or binding on proposers. If it is, one would think that it would be listed in the CAN itself. If it is not, then one would think that NASA would issue a clarification to those people in attendance at the event on 10 December. Keith's 15 Feb 9:00 am EST update: An email just arrived announcing that the CAN has been released. But there is still no mention made on the ISS National Lab website or at NASA's procurement website. One would think that a press release would be in order as well for those who are not on the mailing list - and for those who know nothing about this due to all of NASA's earlier stealth attempts not to publicize this activity. 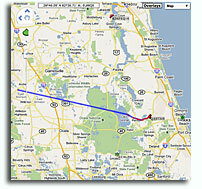 Keith's 15 Feb 6:00 pm EST note: The CAN notice showed up on NASA's procurement website this afternoon and on the ISS National Lab site as well - but it took them 24 hours to do this. By Keith Cowing on February 14, 2011 2:40 PM. "The Commercial Spaceflight Federation today welcomed the strong support for commercial spaceflight in the new NASA FY2012 proposed budget. CSF President Bretton Alexander stated, "In this constrained fiscal environment, commercial spaceflight is more important than ever. NASA's Commercial Crew program will result in significant savings to the US taxpayer, and will cut the amount of money the nation has been sending to Russia every year. Leveraging private investment is the only way NASA can make its dollars go farther in these times of belt-tightening." By Keith Cowing on February 14, 2011 10:30 AM. "The Obama administration's $18.7 billion NASA budget request for fiscal 2012 continues the new policies started in last year's request, with a stronger push into commercial space travel to low Earth orbit (LEO) and modifications to accommodate the three-year NASA authorization enacted in December." "Although the new budget blueprint would roll back overall NASA spending, it does recommend boosts for some NASA sectors, including partnerships with commercial spaceflight companies. The 2012 request allocates $850 million for NASA to partner with American companies to provide astronaut transportation to and from the International Space Station." "The Obama Administration's proposed 2012 National Aeronautics and Space Administration budget, expected to total more than $18.5 billion, is scaling back White House funding projections for private rockets and spacecraft intended to take astronauts into orbit, according to government and industry officials." By Keith Cowing on February 11, 2011 2:46 PM. "The Lockheed Martin Orion team shipped out the first Orion crew module spacecraft structure today from NASA's Michoud Assembly Facility in New Orleans, La. The spacecraft is headed to Lockheed Martin's Denver, Colo. facilities where it will undergo a series of rigorous tests to confirm Orion's ability to safely fly astronauts through all the harsh environments of deep space exploration missions." By Keith Cowing on February 11, 2011 2:14 PM. "Regardless of whether the government agrees to help fund Alliant Techsystems' rocket that would take astronauts to the International Space Station, the Utah company intends to move forward with its project because it believes there will be no shortage of commercial customers. ATK and a partner on Tuesday unveiled the two-stage Liberty rocket that they want NASA to use as the next launch vehicle for the U.S. space program. And they are hoping the space agency will see fit to award it at least a portion of a $200 million pool of money set aside for promising projects." Keith's 10 Feb note: Of course U.S. taxpayers have already made a huge down payment on Ares-1 development. I wonder how ATK gets to use the Ares 1 modified transporter, launch pad, VAB, etc - also modified with lots of tax dollars. That won't cost ATK money? Isn't the use of these designs and facilities using NASA money? Keith's 11 Feb 12:42 pm update: According to ATK's George Torres, who called and left me a voicemail statement: "The ATK spokesperson spoke out of line. What we're really about is to meet goal of CCDev to accelerate commercial program and to try and mature the program and working on the integrate these two systems as part of the deveopment. CCDev funding would accelerate this by 2 years." He said that he'd sent me a statement by email at some point. Keith's 11 Feb 2:14 pm update: Here is ATK's statement: "These comments were inaccurate and from someone who didn't have full insight into the business model as presented for the CCDev2 acquisition. Specifically, our proposal is focused on the goals of CCDev-2, which are to "further advance commercial Crew Transportation System (CTS) concepts and mature the design and development of elements of the system such as launch vehicles and spacecraft." Overall, it really responds to the main goal of the procurement, which is to "accelerate the development of commercial crew systems." If we do win a CCDev-2 contract we can accelerate our first flight two years from 2015 to 2013. With the payload capabilities of Liberty and its low price, we believe it will be a strong competitor for CCDev-2. As for use of KSC facilities, we are responding to NASA's request on how we would utilize KSC facilities (just like other potential contractors) on a leased basis." By Keith Cowing on February 11, 2011 9:23 AM. "Boeing has not abandoned its effort to collect $356 million from its former Sea Launch commercial launch service partners in Russia and Ukraine despite an initial setback at a Swedish arbitration panel, saying the companies in question "have the wherewithal to pay," Boeing said Feb. 9." By Keith Cowing on February 10, 2011 1:19 PM. "The Next-Generation Suborbital Researchers Conference (NSRC) will be held February 28 - March 2, 2011, at The University of Central Florida, Orlando, Florida. A new generation of space vehicles capable of economically delivering payloads and researchers is coming on line. These vehicles will revolutionize space access by providing frequent, low-cost access to space and the capability to carry research and education crew members. They will also carry experiments for technology demonstrations, for scientist in-the-loop research, and for educational/public outreach demonstrations." By Keith Cowing on February 9, 2011 7:57 AM. "This was an opportunity for NASA and our international partners to share the capabilities of the space station with the international community," said International Space Station Program Scientist Julie Robinson, who presented at the seminar. "Now that the station has shifted from construction to research and technology development, we are working as a partnership to optimize its use as a laboratory." Keith's note: Despite the happy press release, no mention is made of this event on the NASA ISS link provided in this press release or the NASA ISS National Lab page. On this U.N. page regarding the event all that is provided is are links to short, two sentence summaries of Robinson's talks. No presentations are posted at the U.N. or at NASA - not that the presentations ever vary much from one venue to another. That said, the ability of the ISS team to do the outreach that they love to brag about is clearly lacking. If the sales pitch never changes, the product gets stale in people's minds after a while. ATK Was Against Commercial Crew - Before It Was For it. By Keith Cowing on February 8, 2011 8:47 PM. 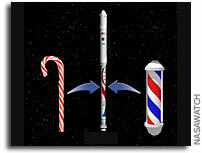 "The Liberty rocket would be crowned with a space-plane or capsule that astronauts would ride into space. "There are about a half a dozen companies out there with capsule designs or small space-planes," Rominger said. "We can lift all of them." ... We at ATK are going to sell them a service," Rominger said. "We own the vehicle, NASA does not. They're merely buying the service from us. They're not buying the vehicle." ATK's Charles Precourt in 2010: "Specifically, the budget calls for the outsourcing of all human spaceflight services to an unproven private sector. What this means to our space program is deeply disturbing. ... Prior to this budget NASA was investing $4B to stimulate private sector space activities. With this budget proposal, NASA's own Constellation Program and its promising future will be canceled to underwrite an additional $6B to this undefined private sector activity." By Keith Cowing on February 8, 2011 2:19 PM. Keith's note: Ares 1 was nicknamed the "Stick". I guess we need a new nickname for Liberty. That slick first stage paint scheme (much better than Ares 1-X white or Ares -1 foam-orange) brings some names to mind - "Candy Cane" and "Barber Pole" for example. By Keith Cowing on February 8, 2011 10:46 AM. Keith's note: I have been (attempting) to listen to the media dial-in for this event today but it is mostly mumbling (bad audio). Only Bob Walker was clear (and making sense). They also showed a video by a Tea Party evangelist (link in the press release). The Tea Party was mentioned frequently by speakers. The only PR for this event was done last night so it did not get much media attention. Indeed, the event's chairman and moderator can't even manage to get a heads up posted on his website. I asked the moderator (Rand Simberg) if the thinks that the President is telling the truth when he says he supports commercial space when he has accused the President of lying on his blog. Simberg replied (he was a little hard to understand on the phone link) that he did not think that the President cared either way about space commercialization. I asked the CAGW how they can reconcile statements in in support of commercial transport to the ISS when they have derided the ISS as a boondoggle for more than a decade. They said that they saw no contradiction. There is a compelling conservative case to be made in support of space commercialization - and transitioning from government-mandated operations to private sector initiatives. The organizers should have limited commentary to Bob Walker (or added Newt Gingrich or Dana Rohrabacher) and that would have been much clearer. By Keith Cowing on February 8, 2011 9:30 AM. "ATK and Astrium (an EADS Company) are working together in response to NASA's Commercial Crew Development-2 (CCDev-2) procurement. The team is offering NASA launch services with the Liberty(TM) rocket. This new launch vehicle combines two of the world's most reliable propulsion systems, with a collective heritage of nearly 150 successful flights. ATK would supply the human-rated first stage, which it developed under NASA's Space Exploration Program. The five-segment solid rocket first stage is derived from the Space Shuttle's four-segment solid rocket boosters (SRBs) which are built by ATK and have flown 107 successful missions since 1988 (encompassing 214 SRBs). Astrium, the developer and manufacturer of the Ariane 5 launcher, working with Snecma (Safran Group), Europe's leading propulsion company, is providing Liberty's second stage based on the liquid-fueled cryogenic core of the Ariane 5 vehicle powered by the Vulcain2." Keith's note: So, let me get this straight: NASA pours billions into ATK to develop the 5-segment SRB first stage of Ares 1. It has never been flown. Massive cost overruns, technical problems, and multi-year schedule delays force its cancellation. Now, ATK takes that multi-billion dollar taxpayer investment, paints a fancy logo on it, and tries to sell it back to the taxpayers as a commercial product? Oh yes, this rocket will deliver "44,500 pounds to the International Space Station orbit". Hmm, that's less than NASA's advertised Ares 1 capability i.e. "25-ton payload capacity to deliver resources and supplies to the International Space Station". By Keith Cowing on February 8, 2011 6:24 AM. Reader note: "I watched the movie "Monsters" last week. "After a NASA deep-space probe crash landed in Mexico..." The 'deep-space probe crash' video is actually the real video of Ares 1-x flight "staging" (i.e. burn-out)." By Keith Cowing on February 7, 2011 8:34 PM. Keith's 25 Jan note: At the ISS National Laboratory Cooperative Agreement Notice (CAN) Public Day on 10 December 2010, Mark Uhran said that the CAN would be released on 14 January 2011. According to Uhran letters of Intent would be due on 14 February 2011, proposals due 4 March 2011, with an award in May 2011. If you go to the NSPIRES page you see that this CAN will now be released on 14 Feruary 2011. No notices have been sent out to interested parties or Public Day attendees informing them of this delay. In addition, no mention is made on the ISS National Lab webpage. Keith's 26 Jan update: By coincidence, NASA's ISS National Lab team Sent this email out today "NASA currently expects the final release of the Cooperative Agreement Notice for the ISS National Lab Management Entity in early February. Answers to remaining questions that have been asked will be posted when the CAN is released." However NSPIRES still says that it will be released on 14 Feb 2011. By Keith Cowing on February 6, 2011 11:41 PM. Keith's note: With the research results presented in these two papers, it would seem that structural information for biological molecules can now be obtained from vanishingly small biological samples - so called "nanocrystals" using a hard X-ray laser - on Earth - no space station required. So much for the official story NASA has told for 20 years that the ISS is crucial for such work. Continue reading Using the ISS: Once Again NASA Has Been Left in the Dust. By Keith Cowing on February 6, 2011 8:06 PM. "NASA Deputy Administrator Lori Garver visited Las Vegas Friday to meet with Nevada entrepreneurs and discuss innovations in space exploration and technology development critical to America's future in space. Garver toured the facilities of Bigelow Aerospace, a company that has been developing expandable space habitats. NASA is evaluating Bigelow's concept for an expandable module for the International Space Station. If approved, the Bigelow Expandable Activity Module, or BEAM, could be launched to the station using a commercial cargo flight and robotically attached to the orbiting laboratory." "Garver toured the facilities of Sierra Nevada Corporation, a company with wide involvement in developing technologies for space exploration. The company's Dream Chaser vehicle is under development with support from NASA's Commercial Crew Development (CCDev) Program to provide crew transportation to and from low Earth orbit." By Keith Cowing on February 6, 2011 8:00 PM. "Astrobotic Technology Inc. today announced it has signed a contract with SpaceX to launch Astrobotic's robotic payload to the Moon on a Falcon 9. The expedition will search for water and deliver payloads, with the robot narrating its adventure while sending 3D video. The mission could launch as soon as December 2013." By Keith Cowing on February 4, 2011 2:28 PM. "We have additional concerns how a year-long CR would affect other critical Federal agencies, including NASA, GSA, FHWA and the FAA as they would face similar challenges under a continuing resolution. Operations vital to our national security and economic prosperity could suffer without full appropriations for these agencies." By Keith Cowing on February 3, 2011 4:28 PM. "Yesterday, Space Florida President Frank DiBello and Robert Bigelow, president of Bigelow Aerospace, signed a Memorandum of Understanding, agreeing to work together to pursue and identify foreign and domestic companies that could benefit from utilization of Bigelow's expandable, orbital space complexes. Bigelow currently has two pathfinder expandable systems successfully orbiting the Earth, and plans to build the first of multiple fully-functioning stations by 2015." By Keith Cowing on February 3, 2011 4:26 PM. "NASA is considering a plan to keep the space shuttle Endeavour in flight-like condition after its last scheduled mission, a move that could lead to its transformation into a privatized spaceship rather than a museum piece." Keith's note: The author has jumped the gun on this and provides a false impression with regard to levela nd nature of any internal sentiment about not rushing to retire the shuttle fleet. This is only a study - if it is done. As such there is no "plan" to "consider". NASA is not "considering" or "weighing" anything other than whether or not they want to pay someone to do a study that challenges a decision the agency has already committed to. NASA is planning to retire the shuttle and has always preserved an option to keep one or more shuttles in good (flight) shape for tests, documentation, etc. before handing them off to museums. If the study is done it will almost certainly use several earlier NASA shuttle commercialization studies from the 80's and 90's that looked at similar things. Indeed, if the study is done, it will likely be delivered after the last shuttle flight when the retirement process has formally begun. The parts and contracts needed to fly the shuttle are already going away and cannot be kept in place forever. To do so costs more money and this core of this notion is reducing costs. The only possible logic to such a proposal would be if the shuttle sidemount HLV was approved. Alas, NASA made certain to surgically scrub any mention of it from what it has presented to the White House and Congress. By Keith Cowing on February 3, 2011 3:26 PM. "Brevard County Sheriff's Office Sgt. David Marich said the homeowner, David Abbey, is a suspect in the case, but has not been charged. Abbey at one time had access to tiles in his previous job with shuttle contractor United Space Alliance. Marich said Abbey allegedly took tiles destined for disposal off KSC property and advertised them for sale on eBay, with prices reaching as high as $880 per tile." By Keith Cowing on February 2, 2011 8:18 PM. "Robonaut 2, the muscular humanoid robot created by General Motors and NASA, will make a guest appearance with Fox Sports analyst Howie Long during the Fox Network pre-game show before Super Bowl XLV on Sunday. R2 and Howie taped a meeting Jan. 31." By Keith Cowing on February 2, 2011 6:28 PM. "NASA Deputy Administrator Lori Garver will travel to Las Vegas and Boulder, Colo., this week to meet with leaders of two commercial space companies, Bigelow Aerospace and Sierra Nevada Corp., and tour their facilities. NASA is partnering with the commercial sector to develop innovative technologies to ensure that the U.S. remains competitive in future space endeavors." By Keith Cowing on February 1, 2011 10:24 AM. "... Moreover, although NASA originally expected that approximately 200 civil service positions would be freed up from performing institutional support services and reassigned to "critical mission-related activities" as a result of the transfer of services to the NSSC, the Office of Inspector General (OIG) found that these employees were often placed in new positions or assigned to backfill positions in the same functional areas from which services had been transferred. Finally, the OIG found that NASA's claim that creation of the NSSC would save the Agency $121 million over a 10-year period (fiscal years 2006 through 2015) was based on flawed data and is therefore inaccurate. Our analysis determined that cost data supplied by the Centers, which was essential in determining the baseline cost calculations and return-on-investment projections, were not reliable or verifiable." This page is an archive of entries in the Commercialization category from February 2011. Commercialization: January 2011 is the previous archive. Commercialization: March 2011 is the next archive.